Whom are You Following; Jesus, or an LDS Prophet? Today we’re publishing our new page for an all important Mormon topic; ‘Follow the Prophet’. We published an article on this about 3.5 yrs ago, but since then the amount of attention the Church has given to this warrants our time, and updates with many of the things they’ve said. We’ve listed some of the contents of our new page below, but for future reference you can find it in full on the sidebar over to the right. What God-fearing Christian doesn’t know, and treat with awe, the words of Christ in this passage? I don’t know of any. Do you? One sign that Mormonism doesn’t qualify as a Christian church is because of statements made by their leaders we’re looking at today. Pray for them, won’t you? Their comments are so brazen and rebellious, it immediately stops me in my tracks. I’m not so much concerned about the disregard for their own canon, as I am about the word of God. Obviously, if they truly loved Jesus, they’d heed His precious words. The garish images on the left are but a few of the resources Mormonism relies upon. Coupled with the comments we see today, they stand as a testament to what’s going on inside their hearts. The other day I came across an online repository of sorts filled with LDS references about the Mormon Holy Ghost. The quotes were taken from speeches, and writings of past and present leaders of Mormonism, and as it turned out the page was written by a professor at BYU, Bruce K. Satterfield. Looking over some of these I can’t help but feel sorry for those who absorb this into their spirit. There’s mass confusion from one leader to the next with no solid foundational truth upon which to stand. It’s no wonder the #1 issue for many new ex-Mormons is a lack of confidence about God’s Holy Spirit, and how He operates. I just cannot imagine living life without God’s Holy Spirit as a constant staple in my life. When I’m lonely, or unsure about life, without fail, He is always there to guide me along and clarify doubts for me in His word and His presence. As time has waned on for the Church, they’ve made a strict practice of not giving heed to many of their past proclamations. In Mormonism, there are no hard and fast rules, and our example today is a classic display of how they operate. 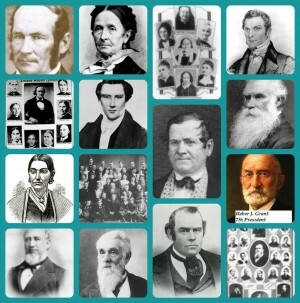 God’s Hand in Our Nation’s History, p. 3; “Later Nephi saw this in vision: “And I looked and beheld a man among the Gentiles, who was separated from the seed of my brethren by the many waters; and I beheld the Spirit of God, and it came down and wrought upon the man; and he went forth upon the many waters” (1 Nephi 13:12). Ezra Taft Benson was born into a well established, successful family who had set about gaining employment in everything from farming to politics. At the end of the Revolutionary War no less than George Washington himself stayed at the home and inn of one of the Taft’s when he began his run for US President. The drive to succeed wasn’t lost with Ezra as he began to establish a career and carve a little niche for himself in the new country. His ventures took him from farming to hotel entrepreneur, cotton mill owner to LDS apostle.